In just ten minutes, the panorama funicular takes guests from Interlaken up to its local mountain Harder Kulm. 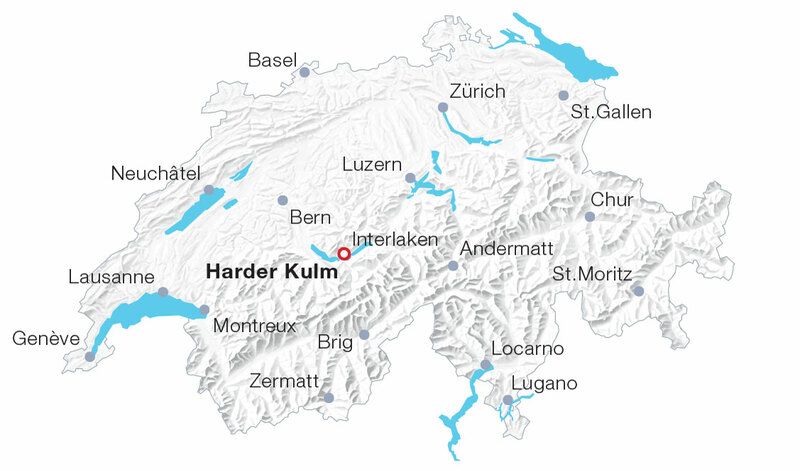 For more than 100 years, the funicular has been negotiating the 735 meters of altitude to the Harder Kulm, located at 1,322 meters. The journey starts not far from Interlaken Ost station, leads through a charming forest and passes the wildlife park. A five-minute walk takes visitors from the mountain station to the lovely restaurant with turrets and a red tile roof. Next to the restaurant, guests may visit the “Two-Lakes-Bridge” and an airy viewing platform with a glass area in its floor. From there, truly deep sights can be seen and the magnificent view to Eiger, Mönch and Jungfrau as well as Lakes Brienz and Thun can be savoured. Panorama Restaurant with spacious terrace. New, spacious panoramic pavilion with up to 130 seats.